I was lucky to be invited to a recently refurbished McDonald's restaurant in the centre of Leeds. 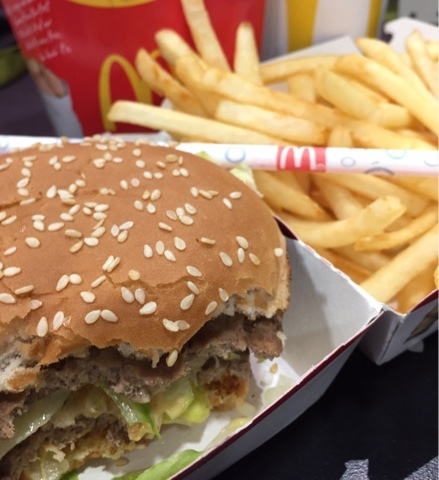 McDonald's has to be the world's best known fast food chain and one that we have been enjoying for years! I have fond memories of having McDonald's as a child and even of my late Nanna asking for cutlery when we gave her her meal. With McDonald's you know what you are going to get. If you order a Big Mac in Spain, you know that it is going to taste the same as it does in England. 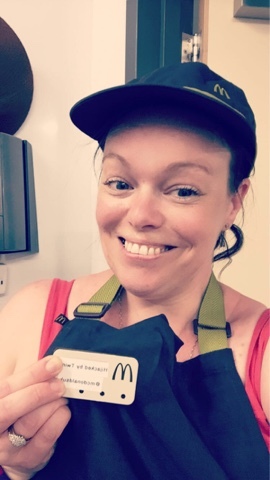 So when I was offered the chance to learn more about how McDonald's are evolving and how they are making their food even fresher I could not wait to attend! The first thing I noticed when I arrived at the Briggate Leeds restaurant was the modern, street art deco throughout the restaurant. 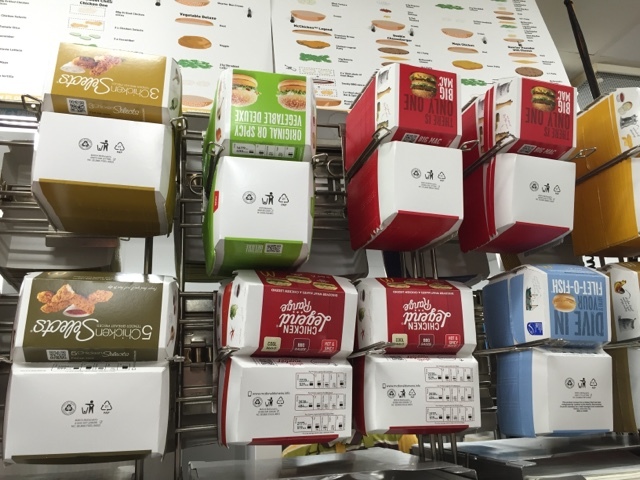 The restaurant had a fresh feel to it and was the first way that I saw how McDonald's is evolving. To start I met some of the senior McDonald's staff, the press team and two other bloggers. It was during this meeting that we were given some background information about McDonald's. Did you know that in the UK there are 1250 restaurants? I knew there were a lot but what I did not know is that a lot of these restaurants are actually franchise restaurants! At the end of 2013 beginning of 2014 McDonald's started to refurbish their restaurants. 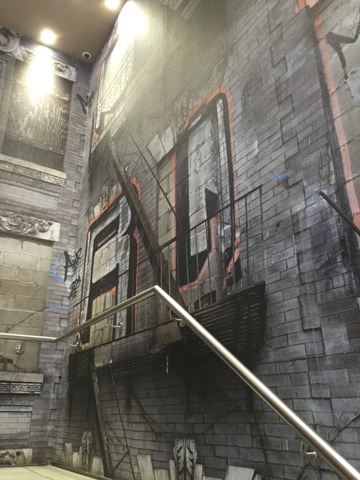 They wanted the digital age to be a huge part of the refurbishment. This includes self service kiosks. So far 500 restaurants have undergone the refurbishment and they aim to have all of their 1250 restaurants completed by 2018. Not only is the digital age a big focus but the companies commitment to the environment is essential. They now have two bins for your rubbish. One for landfill and the other for recycling waste. They have also been using their waste cooking oil to fuel their delivery lorries! What a genius way to reuse it! After having a chat it was time to go down to the restaurant and the kitchen. 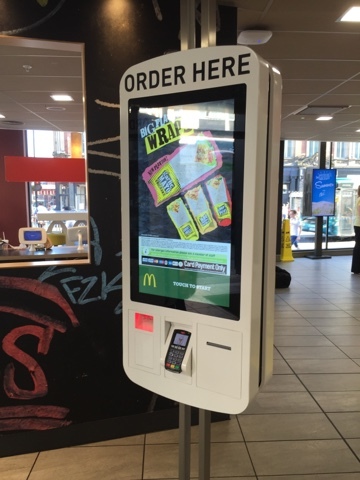 While we were there we got the chance to see and even have a go at ordering a meal using the new digital self service kiosk. My immediate thought was "wow the kids would love ordering their food!". 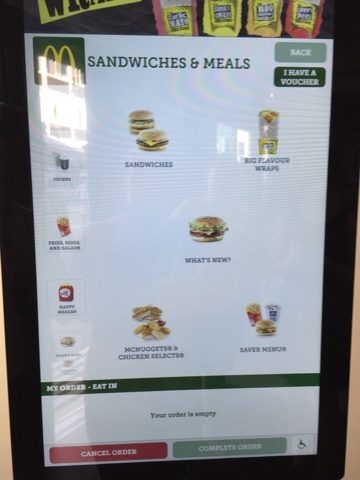 The kiosk is a touch screen so you simply touch the meal you would like and it will take you through to see what sides are available, give you drinks options and also dessert choices. For anyone on holiday or that does not speak English you can select your relevant language so that there is not the language barrier. 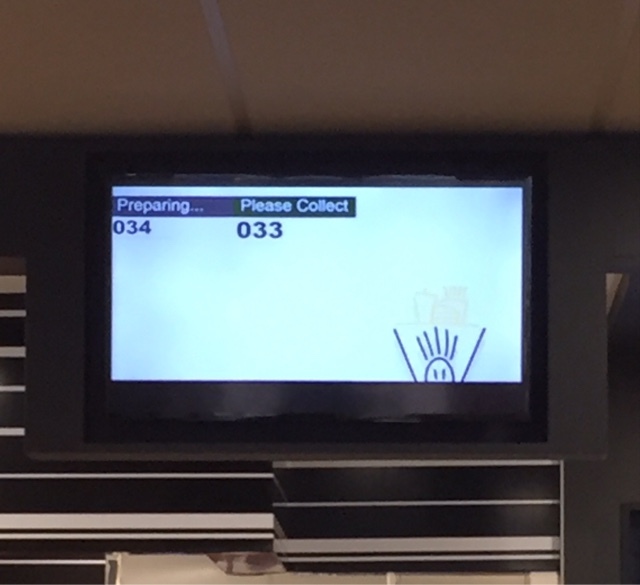 Once you have completed your order and paid for it your order goes through to the kitchen to be prepared. As soon as the kitchen receives the order all of the sandwiches, nuggets and wraps are made fresh. The heated waiting area that usually has a stock of burgers has gone. All food is cooked to order so you know that your burger is fresh and inevitably it tastes even better! If you would like to involve the children or are in a wheelchair you can select the disabled option and the screen minimises down to a reachable height. I was pleased to see that when you put an order through for a Happy Meal you are offered healthier options for the children's side dish but also when you go to select the drink you are first offered the healthier drinks of juice, milk or water. If you want your child to have the fizzy drinks you need to go to a separate section. This makes going for the healthier option so much easier as they are what the children see first! I did ask if having the technology installed has effected the number of people that they employ. I was told that the technology had in fact increased the number of staff. As the food is now cooked freshly to order they need more staff in the kitchen. When waiting for your meal you can either wait for your number to come up on the screen or select table service when checking out! So if you have children this is a great way to get them sat down and ready for their food. This will also make life so much easier when trying to juggle the children, carrying a tray or like us we often need more than one tray so until McDonald's offered this service it was easier to take the children through the drive through. 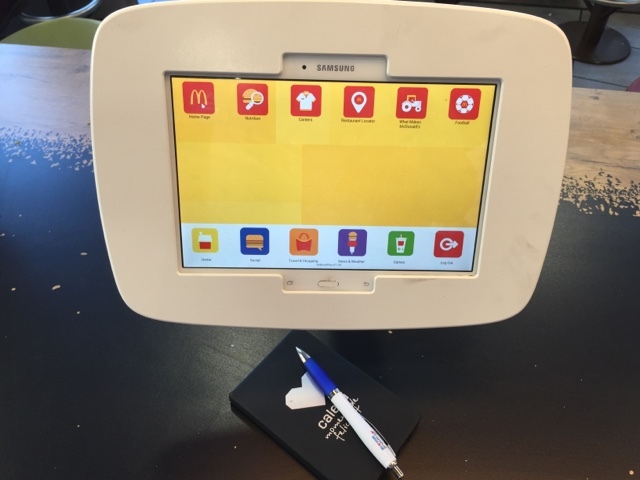 To satisfy the modern necessity to have internet access McDonald's provide free Wi-Fi and now also have a table of Samsung tablets for customers to use. So whether you are calling in and want to check the news or weather or are with the children and want to keep them occupied while they wait for their food you now have a technology based activity for them! Next it was time to have a look at what goes on behind the scenes! We were able to look at the staff area, fridges, freezer and store cupboard. I was amazed to discover that all of the burgers are cooked from frozen. But after thinking about it I can see how cooking them this way saves on food waste. One thing that I was keen to find out was about the food sources. As a family we are passionate about knowing where our food has come from so these questions were top of my list. I was delighted to hear that all of McDonald's beef burgers in the UK are made using British or Irish beef. All of the farms have been quality assessed so you know that you are getting quality beef. I was amazed to discover that the McDonald's fries are actually made by McCain at their Scarborough factory, which is fantastic news for local potato growers! The fresh produce is obviously season dependent but are sourced from British suppliers when possible. The bread comes from British bakers, the eggs are all free range British eggs and the milk is all organic and British. The chicken does mainly come from Thailand but I was assured that the suppliers are long term suppliers of McDonald's and their chicken farm standards are, if anything, higher that the standards in the UK. Now, I will admit that I was excited when I learnt that I would be having a go at making my very own Big Mac. Before we were able to prepare our Big Macs we had to get dressed appropriately! Yes, I had a hat, apron and even a badge that I got to bring home! The kids have already dressed up and played cooking in McDonald's! Once we were ready we were shown how to prepare the legendary Big Mac. After toasting the bread we went on to assemble the burger. First you place the bottom bread in the bottom half of the box and the top and middle bread in the top half of the box. Next the secret sauce is added to both halves, followed by diced onions, lettuce on both sides, pickles on one side, then the burgers, cheese on the side without the pickles. Finally place the middle bun and toppings on the bottom burger. Leave the burger top in the top half of the box and close. Your Big Mac is complete! I did try and spy the ingredients in the secret sauce but failed miserably I am afraid! Of course after we had made out Big Mac's we got to eat them! This was a great event that flew by. For a foodie it was great to get first hand food information and see what goes on behind the scenes. 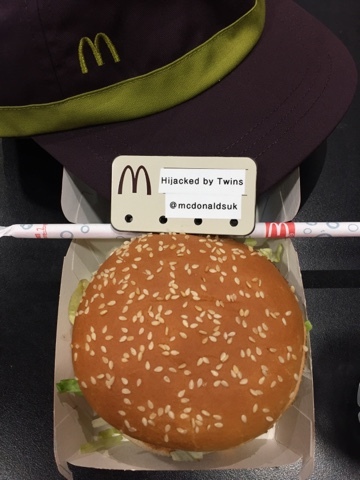 To find out more about what McDonald's do pop over to the McDonalds website. Their website gives you all of the food information, nutritional details, news, offers, promotions, restaurants and what McDonald's contribute to the world. 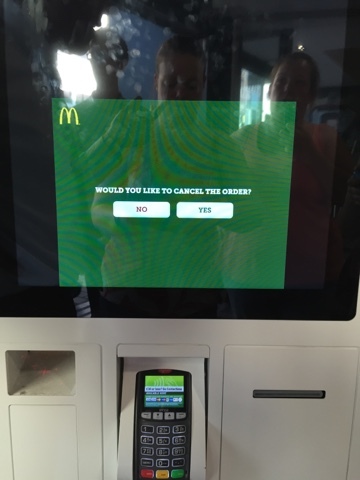 This summer holiday, if you have kids that love McDonald's, I would recommend checking out a refurbished restaurant and giving the new technology a go!